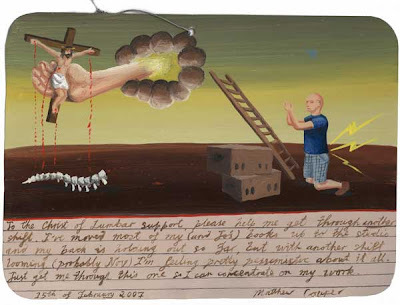 An ex-voto from 2007, painted while shifting out of Tylee Cottage at the end of my residency there. I was able to paint it as we still had our studio, although I had to shift all my resource books from the cottage to the studio - meaning up a couple of flights of stairs. The recent shift out of the studio hasn't been too bad as it's all going downstairs. The painting features my favourite shifting object - Bonita banana boxes. Like a full-scale game of Tetris, we filled up our storage unit yesterday. I'm very surprised how much stuff you can fit into a 3m x 2m space. 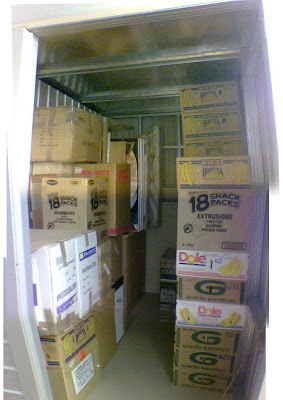 We've always been hoarders, yet it's still good to know that we can store our life in such a small shed. We're finishing packing the odds and ends today.